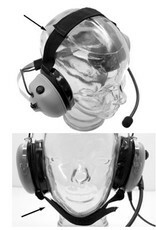 Attaches to domes below the ear seal to provide support. For aerobatics, when wearing an aviation headset, it can be worn under the chin as a chin strap that helps keep the headset in place during High-G manuevers. For Behind-the-head model headsets, it is worn over the head to help keep it in place.